In this week's Abundance Insider: Living clothing, robot cops in Dubai, and Fidelity’s experiments with bitcoin. What it is: Melding biological systems and materials engineering, researchers at MIT led by Wen Wang have developed a self-ventilating workout suit by incorporating genetically engineered nonpathogenic E. coli into small ventilating flaps. Printed onto latex sheets and placed into thumbnail and fingernail sized flaps, the cells expand in response to heat and humidity, opening and closing to provide ventilation. What it is: In a reboot of the match which pitted AlphaGo against Lee Sedol, one of the world's top Go players (in which AlphaGo won 4 to 1), the AI recently won again by a small margin. Competing against Ke Jie, the world's best Go player, the AI won by a half-point -- but only used one-tenth of the hardware it required last year. Google's DeepMind team plans to turn AlphaGo into a tool that the Go community can use to help players improve their games. What it is: Philipp Holl, a 23-year-old undergraduate physics student at the Technical University of Munich, has created a dual antenna and software system capable of scanning a room via its Wi-Fi transmission to create a 3D hologram. With one stationary antenna and one that moves, each recording the phase and intensity of the Wi-Fi signal, Holl’s software layers together the many 2D images into one 3D holography at a sufficiently detailed granularity to identify a person or dog sitting on a couch. While 2D images via Wi-Fi have been used for years to identify intruders through walls, this is the first system to create a 3D scan. What it is: The Dubai police force recently deployed its first fleet of robot police officers on May 24, with plans to recruit enough robots to make up 25% of its police force by 2030. Citizens of Dubai can report crimes to an adapted version of the REEM humanoid robot, which expedites real-life investigations carried out by humans. 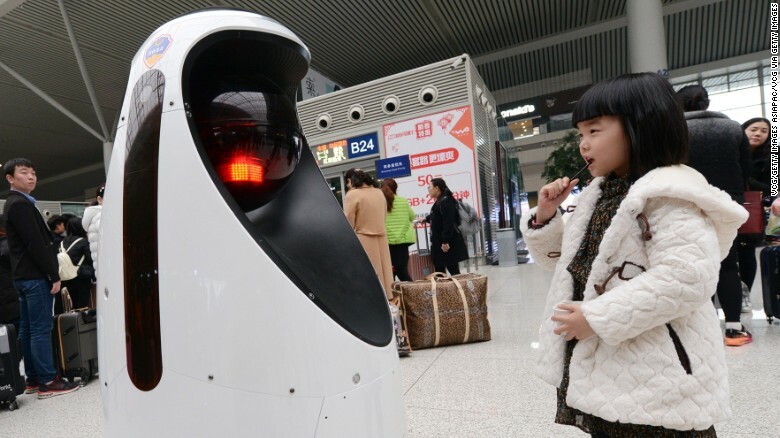 The REEM robot's facial recognition technology currently performs with 80% accuracy, and uses its camera eye to send live feeds to a command control center for further analysis. Dubai police see the robot evolving into an interactive service for citizens as more units roll out in the near future. What it is: Speaking recently at the Consensus conference in New York, Abigail Johnson -- CEO of Fidelity, the world’s largest asset management firm -- announced that she is a huge believer in bitcoin and that customers will soon be able to see balances of their bitcoin assets on Fidelity if they have an account with Coinbase. Noting the potential to fundamentally change market structures, Johnson has been encouraging Fidelity employees to experiment with bitcoin and digital currencies. In addition to using bitcoin to pay for food in the Fidelity cafeteria and accepting donations via bitcoin, the firm also started mining bitcoins for educational purposes, surprisingly making a lot of money in the process. What it is: Y Combinator-backed OSVehicle recently launched EDIT, the first “ready to use Self Driving EV,” out of stealth mode after a year in development. EDIT’s aim is to allow automakers to whitelabel cars and customize specifications such as range, look, hardware, code, and more. In addition to bringing cars to market in half the time at one-sixth of the cost, OSVehicle could enable mass customization of vehicles tailored to the desired function versus the brand. What it is: The American arm of the Chinese wind turbine manufacturer Goldwind recently announced that the company is opening up a free training program for U.S. coal miners to retrain to become wind farm technicians. The company plans to focus on Carbon County, Wyoming -- a town named for its extensive coal deposits, which have been dwindling away over the past few years, resulting in hundreds of people losing their jobs in 2016. Goldwind believes coal mining skills -- mechanical and electrical engineering, in addition to experience working in difficult conditions -- are a natural fit for wind farming.